Kinesio Taping Personal Story – HEEL PAIN « Spine Solvers Inc. This entry was posted on Sunday, May 26th, 2013 at 6:45 pm	and is filed under Uncategorized. You can follow any responses to this entry through the RSS 2.0 feed. You can skip to the end and leave a response. Pinging is currently not allowed. This seems very similar to my son’s case and my husband and I are very interested in trying the Kineso tape for him. He is 13 yrs old and has had heel, side heel & even spread to Achilles & arch in both feet but mainly the left.. Right when he turned 12 he began having issues. He had played soccer in the fall and immediately began basketball. Toward the end of the season his issues began. He was also diagnosed by a podiatrist with Sever’s disease due to the pain and the extremely large growth plate in his heal bone. He has seen an Ortho foot specialist who said his calf muscles where extremely tight and caused his big toe to overcompensate and was resulting in bone spurs at the top of his foot. His foot is very narrow and his second toe is the longest. 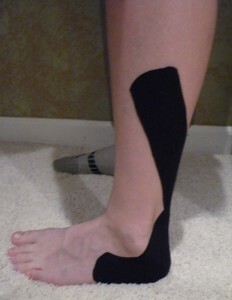 We stretched, got orthotics, tried laser therapy and rested from sports for a year. During this year my son has grown 6+ inches. He is 5′ 91/2″ and weights 109 lbs. He is very frustrated with his situation as it leaves him out of playing with his friends. It is also hard for others to understand and his peers tease him.